If you’re planning to perform a similar mod, a word of warning. Depending on the type of motherboard version, VIC-II chip and RF-modulator, stuff like pinouts and component reference numbers can vary. So instead of soldering stuff together according to my pictures, closely check the schematics which correspond with the C64 you have. 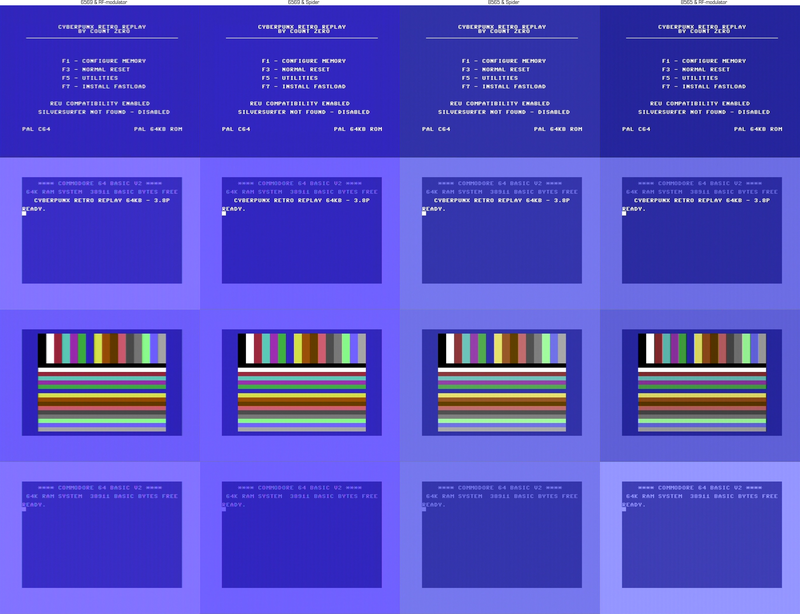 Zimmers.net hosts a healthy amount of Commodore reference documents. First up, the A/V-connector has to go. Obviously, the new S-video compliant connector won’t fit on the mainboard and so, some adapter board is needed. I decided to fashion mine out of a leftover piece of perfboard (9*9 holes). The connection points on the mainboard/connector match the standard 100-mil (2.54mm) spacing, and thus can be used to solder the new board in place. Won’t go further into construction details since I think the pictures describe enough. 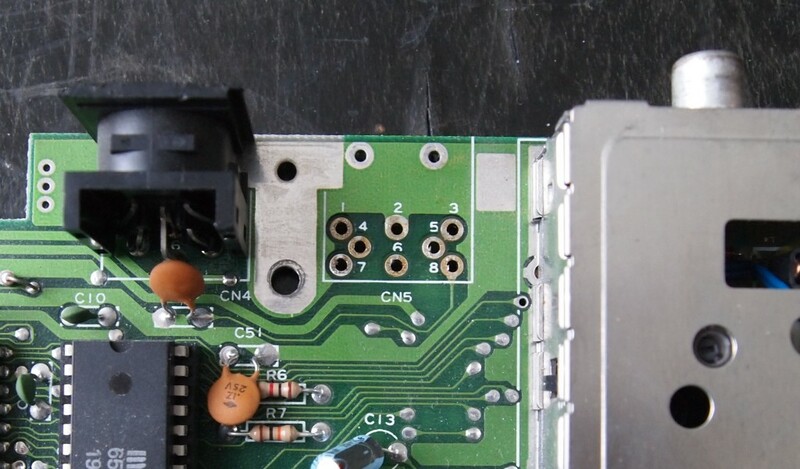 My adapter board also has a series resistor to dampen the chroma signal and a jumper for (dis-)connecting the audio input. For the chroma resistor, a value of 330R is often suggested; I didn’t have one at hand so I used a recycled 470R trimmer dialed “about there”. On this particular board, the resistors in the bottom do nothing else than raise the perfboard (and the connector) off the mainboard. 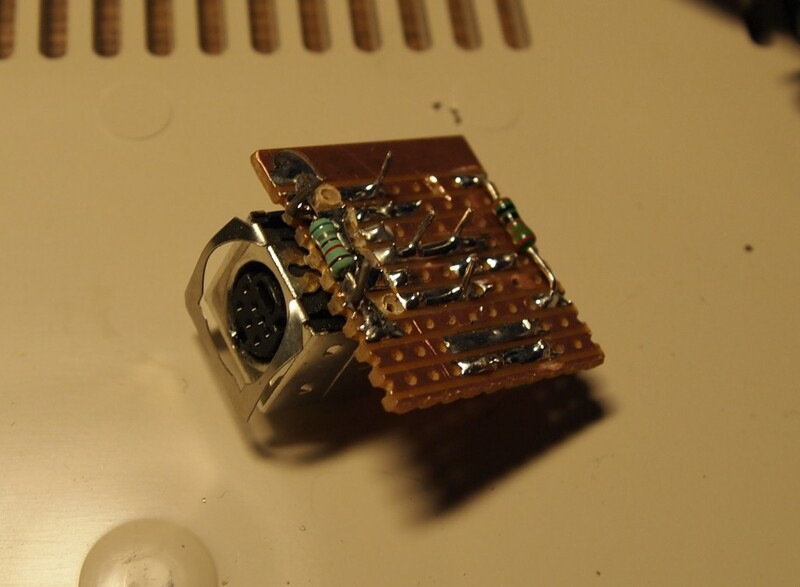 C64 enthusiasts say that disconnecting the RF sub-circuit improves picture quality. Given that it was so easy to perform (at least with the particular RF-module I have), who am I to argue.. 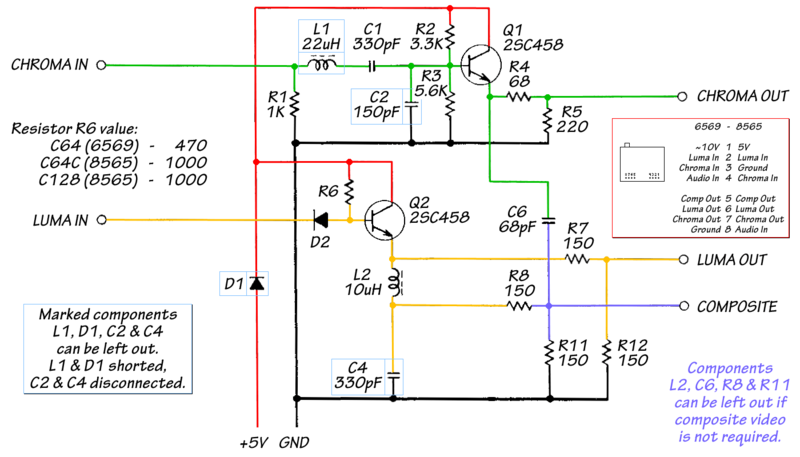 Looking at the schematic of model #251696 modulator, +5V is fed through L10 whereas the junction of C5, R9 and R10 connects to R20 with a jumper link. So to disconnect the RF sub-circuit, I just lifted up the other end of L10 and the jumper link, and that’s it. Can’t tell if this improved the picture in any way: I have my C64 hooked to a LCD through a cheapo”‘S-video to VGA” -converter and that adds some artefacts of its own..
RF sub-circuit disconnected from +5V / composite video and audio out routed to RCA. Rear view of mainboard with mods added. ..and just take a look at the picture quality esp. with model 6569 VIC-II. Pretty awesome! Zero-X also mentioned that one additional mod would be to clean up the VIC-II AEC signalling with something called the “AEC fix“. Apparently this signal adds some repeating vertical ghosts over the picture. 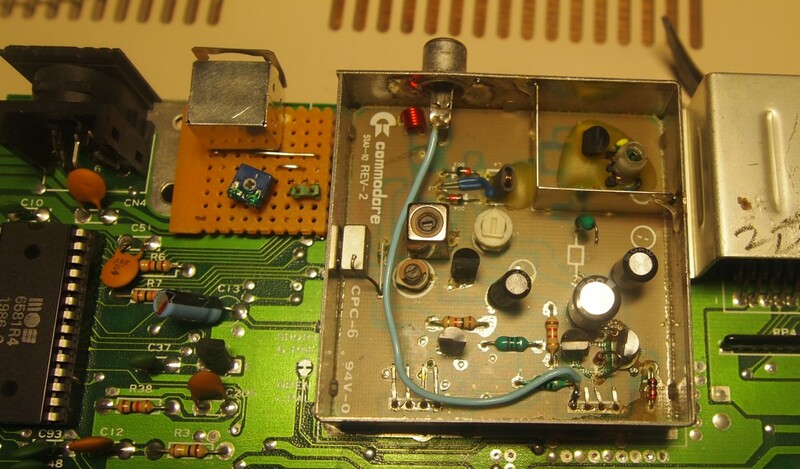 Yet another mod would be to remove the RF modulator altogether and make a separate amplifier board for the chroma/luma signals. Hey, nice idea with the S-Video connector adapter board replacing the DIN connector, and taking the audio from the RF jack. Neat job! One could also extend on the idea with the jumper to use it to ground the audio input – which would reduce background noise. Would have been interesting to know if the simple disconnecting of those two components in the RFU made any noticeable difference to picture quality. Yeah it’s just impossible to compare any fine improvements with the setup I have (s-video through VGA converter to LCD). Just too much “lost in translation”. Definitely would require a proper CRT to analyze the difference. Hello, i want a new tv/monitor for my c64. A led tv with 50.something hertz. So it works smoothly with all demos gfx modes inclusif side border stuff. Any sugestions ,brand and type. Smoothness is the most important factor. Sorry can’t help you, don’t know anything about suitable models. Hello, just a question: in the schematics by Zero-X which kind of diodes should D1 and D2 be? My C64C has PAL RF Modulator 251916-03 (made by Mitsumi Elec Inc), There is no known schematic diagram and silk-screen printing does not have any component labeling either. Most C64C service-manuals refer to 251696 even zero-x’s fix is targeted for it. I see that your RF Modulator is also without any component markings. Did you reversed engineered the ckt to get to the L10 and concluded that the jumper needs to be cut? I see that your RF Modulator is also without any component markings. Did you reversed engineered the ckt to get to the L10 and concluded that the jumper needs to be cut? Uhh my memory is a bit hazy on the details, but yeah I do recall taking some continuity checks between parts to determine which parts/pins are interconnected. I’d suggest trying the same with the one you have, like just to see if the circuit matches with either version 251025 or 251696 (= schematics at Zimmers.net).